Sometimes one feels almost responsible when you have people visit your city and the weather is not good. Well, many of us feel like that with visitors in NYC this time of the year with temperatures low, and freezing wind. So if you don’t want to be outdoors for too long this weekend, we suggest a stop at the Museum of the City of New York. They always have something interesting going on there, and you can feel that you’re out in NYC through some of their NY-themed collections and exhibitions. 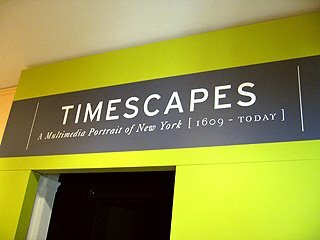 Timescapes is a three-screen multimedia experience that traces the history of New York City from its origins to its present status – all in 22 minutes. Click HERE to find more information and Schedule.